The world is now a "global village." Businesses are going international. The world is now a "global village." Businesses are going international. They're increasingly embracing talents with the capability to be professionally compatible in various departments within business organizations and professionals with a firm understanding of this "global village." These days, talent acquisitionists seek for candidates with interdisciplinary intellect, cross-demographic perception and intuitive adaptability. Education empowers but can have constraints. Understanding the intricacies of day-to-day business operations all while learning theories in a classroom can be a daunting task. A true global level business education demands discerning faculties who can guide students with the right approach and information; a serene state-of-the-art facility; collaboration with universities from around the world; and meaningful partnerships with companies operating in various sectors to facilitate student trainings. 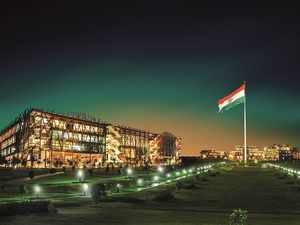 Jindal Global Business School (JGBS), part of the O P Jindal Global University (JGU) offers a wide range of MBA courses with specialization in multiple disciplines pertinent to the current global business world. Applying a unique approach, JGBS' MBA courses are meticulously designed to help students from any educational background understand the global business world better and help them transform themselves into future-ready professionals. MBA specializations offered at JGBS include Marketing & Sales Management, Entrepreneurship, Banking & Finance, Operations & Supply Chain Management, Human Capital Management, Business Analytics and more. JGU hand picks educators with experience and qualifications from some of the top universities including Harvard, Oxford, IIT, IIM, etc. and maintains a student-teacher ratio of 1:13 while JGBS maintains a student-teacher ratio of 1:15 . The world-class faculty garnered from around 20 countries not only focus on providing clarity-driven in-depth knowledge but also encourage innovative and critical thinking among students. More than knowledge, faculties here try and inculcate wisdom into students. The University follows a multi-disciplinary approach in terms of education which allows students to integrate their business education with courses from other disciplines such as humanities & liberal arts, law, international affairs and public policy. This allows students to expand their horizon of knowledge and achieve holistic growth. The curriculum followed here spurs a whiff of clarity among learners. Here, students are encouraged to contemplate their thoughts, ponder upon their predicaments and discover their true self. In collaboration with several globally renowned universities, JGBS allows students to study abroad through immersion trips, semester exchange or transfer to earn a second degree from foreign partner institutions programmes. Additionally, students can also learn several foreign languages by enrolling in a relevant course and improve their prospects of working in foreign countries. JGBS also offers industry-specific MBA courses in partnership with several global leaders such as IBM and KPMG. These strategic partnerships allow students here to learn tools used in the industry, get hands-on experience of business operations before entering the professional world and prepare for the future. It particularly helps students opting for MBA right after their graduation. Having clarity on how the corporate world functions help them plan their journey ahead. The full-time MBA courses offered here span for a duration of 2 years commencing from 1 August 2019. JGBS provides residential facilities to every student within its state-of-the-art facilities at nominal charges. With 1400 successfully placed alumni, JGU ranks among the top 3 % universities in the BRICS region. The university boasts of a globally networked career development & placement division and students of JGBS have been successfully placed in some of the most reputable companies all over the world. 1. Recent graduates from any educational background aiming to achieve a management degree to improve their career prospects and excel in life. 2. Corporate professionals looking forward to getting an MBA and climb the hierarchical ladder in their industry. 3. Entrepreneurs in search of proper guidance and mentorship to help them disrupt, innovate and achieve. Bachelor's (any subject) with minimum 50% aggregate marks (graduate students may cite latest scores). CAT, MAT, ATMA, CMAT, XAT, GMAT, NMAT, GRE or any other equivalent MBA entrance exam.